Come join us in the dance. Contact Improvisation is dance/sport/art form involving an open-ended exploration of movement by listening with our bodies through a moving point of contact. It is a meeting point of physics, meditation and playfulness investigated within the body and in dialogue with another. 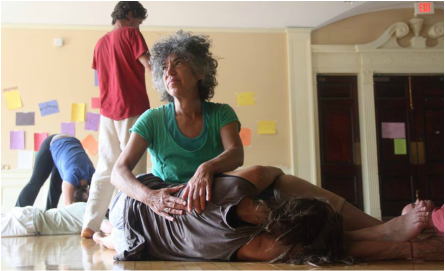 As you engage the practice of contact improv, you may learn: ease of movement, comfortable ways for your body to share and receive weight, how to cultivate awareness and listening with eyes, ears, and skin, and how to be authentic to your own dance while moving with others. No prior experience required. Witnessing and observing are welcome elements of this practice. We also offer contact improv class series each year.